This Blonde Brownies Recipe is a variation of traditional chocolate brownies, but has become a classic in its own right. Both blondies and brownies are cake-like bar cookies, which are cut into individual pieces and are eaten with your fingers. Yet while brownies call upon cocoa or melted chocolate for flavoring – and a corresponding dark coloring – blondies are flavored with brown sugar and vanilla, tinted in a matching golden brown. The result is a rich cookie with a dense texture. Plus, they are simple. The bars call for just 7 ingredients – 8 if you sprinkle toppings on the surface. Preheat oven to 350º F. Line a 13 x 9 baking pan with parchment paper or aluminum foil, allowing ends to extend over two sides of the pan. Coat the liner lightly with vegetable spray. In a small, microwave-safe bowl, melt the butter. Allow it to cool to room temperature. Pour the melted butter into a medium-sized mixing bowl. Add brown sugar. Using an electric mixer on medium speed, combine the melted butter. Add eggs and vanilla extract, mixing until the dough is well blended. Blend in dry ingredients gradually. Stir in 1 cup of nuts. The dough will be thick. Spread mixture evenly onto bottom of the prepared baking pan. Sprinkle the surface with 1 cup chocolate chips or nuts. Bake for 25-30 minutes. The surface of the blondies will darken, thanks to the brown sugar. Do not over bake. Remove the pan from the oven. Cover the cookies with a piece of aluminum foil, stretched across the pan and crimped around edges tightly, which will help the bars to stay moist. Use a sharp knife to poke 8-12 tiny holes in the surface of the foil for venting. Allow the pan to cool completely on a wire rack. Store bars loosely covered at room temperature or in the refrigerator. 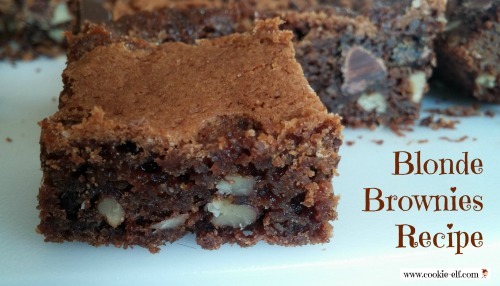 This Blonde Brownies Recipe has a dense texture that allows the individually-cut bars to be eaten as finger food. The dough is thick and rich. Be sure to press the cookie dough evenly into the pan to ensure uniform baking. You can omit the extra chips or nuts on cookie surface, if you wish. To help cut bars cleanly, set the cooled pan in the refrigerator for one hour. Then cut bars according to the above instructions. See more brownies and blondies on our Pinterest board.